RF: Gladly! After my studies, I started working for Philips in 1985 in the radio department, but of course, the CD was already making its triumphant progress and so I got involved relatively quickly in this area. That was a very dynamic affair at the time, as the D/A converter technology was still in its infancy. The various manufacturers experimented with very different types of transducers and, of course, also repeatedly presented their changed concepts to the specialist audience and the trade press. Ultimately, by and large, such processes have prevailed, which initially convert the signal to a low bit depth before the actual conversion process. At Philips, we relocated relatively quickly to a 1-bit conversion process with correspondingly high over-sampling. Of course, the question of the jitter problem is all the more urgent, but one has to deal with only two sampling states. This solution ultimately convinced us in terms of sound and technical feasibility. After spending five years in the converter development, it was just time for something new. So I am finally in the field of product management/marketing changes, so I worked almost at the interface of development and sales and, among other things, press and public relations, prepared fairs, conducted field service training and participated in dealer events. Over time, I have taken over and managed a whole series of other projects, and then joined the development of the SA-10 about three years ago. HaF: You have brought the keyword. Tell us something more about the development process of the 10 series in general. You also worked closely with Ken Ishiwata, right? 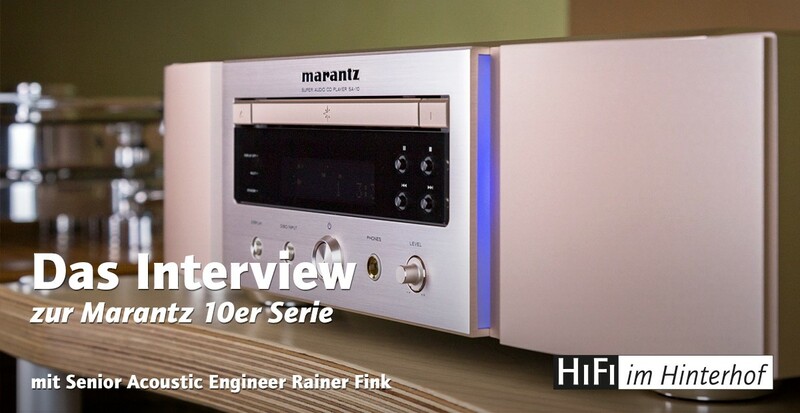 RF: The development of SA-10 and PM-10 took place in close coordination with the Marantz team in Japan. There are also the production plants and I myself have been there five times in the last two years and the colleagues are of course also vice versa come to Europe, where we worked on the circuit design, have tried different variants and have heard etc. Of course, Ken Ishiwata, who may well be known to some as Marantz’s „Brand Ambassador“, was also heavily involved in the project. Ken just has a lot of experience and this helps a lot in the development: In the regular listening tests, it is one thing to identify any remaining weaknesses, but finding the right starting point for improvement is a completely different challenge. Ken is very good at it, because he knows all about the mechanical components as well as in the field of electronics – which components bring which characteristics with it etc. Of course, it is enormously helpful to have someone on board. HaF: Speaking of components and electronics, what do SA-10 and PM-10 have to offer? RF: As I said, I have been mainly involved in the development of the SA-10 and here again in particular in the area of digital and converter technology and the associated software. That was an extremely challenging and exciting project. The basic parameters and programming were comparatively fast, but choosing the hardware and optimizing the sound took a whole year longer than originally planned. Of course, there are always several ways to get there, and we finally took the time to get the best result from our point of view. We work with two separate clocks for 44.1 kHz and multiples (88.2 kHz, 176.4 kHz etc.) as well as 48 kHz and multiples (96 kHz, 192 kHz etc.) and also the combination of 1 bit conversion and overclocking. Sampling, which I mentioned above, is used in a current variant. For the PM-10, we decided on a fairly rigorous start, because we are now using switching amplifiers for the first time. By chance, at a trade show, two old colleagues from Philips came into contact with each other, who had developed a very interesting concept that was superior to conventional switching amplifiers in many respects. Ultimately, the solution was technically and sonically so convincing that we took this step. Apart from that, the idea behind the circuit of the PM-10 is remarkable: We basically tried to implement the concept „pre-stage + two monoblocks“, but then put all three elements in one housing. RF: Over the years, we have always chosen a kind of in-house reference system, which we used to assess current developments. That was the system we released for the 50th anniversary of Marantz – a combination of an SA-7 SACD player, the SC-7 preamplifier, and two SA-9 monoblocks. Unfortunately, we had to stop these devices because of new regulations for certain components at some point and so came the thought that it was time to explore the maximum on the current technological level. With regard to the successor of the SA-7, we already had enough „feed“ for such a project in the hindquarters and in the conception of the PM-10 stood then than the combination of SC-7 and the two SA-9 godfather. It is important to mention that these components were completely symmetrical at the time. Unbalanced signals were immediately balanced in the SC-7, and the SA-9 monoblock can basically be thought of as a stereo output stage in bridge mode. In the meantime, it is possible to develop all this so compact that we only need one single case. The pre-amp and both power amps each have their own power supply and the symmetrical structure has been fully maintained, i. There are four amplifier modules in the PM-10’s power section. A major advantage of this solution is that the cable paths between the individual elements are eliminated and possible signal losses are precluded from the outset. On the other hand, in order to minimize the mutual influence of the individual areas, we have completely lined the housing with copper inside. Ultimately, we are extremely pleased with this result and very proud of both devices. HaF: Let’s stay with the technology for a moment. You have been using the so-called HDAM modules for years and there are apparently two different applications and now several generations. What’s it all about? RF: We have been using HDAM modules in various designs since the 1990s. At that time, so-called operational amplifiers were generally used in the analog output stages of CD players with their filter sections. However, the selection here was relatively limited and there was a lot of room for improvement. So we developed the first HDAM module that ran in Class A mode and was superior in terms of technical parameters to the available operational amplifiers. In addition to the actual amplification of a signal, we also use the HDAM modules as buffer stages (HDAM SA modules). This is not about amplifying a signal in the true sense, but merely supplying power and conditioning the signal, so the input is basically the output signal. The different generations, in turn, are due not least to the fact that certain elements were no longer available, for example, because of environmental regulations and we had to find a corresponding replacement. Incidentally, we’ve also been using the HDAM SA modules in the power amplifier sections of our amplifiers since we switched to negative current feedback design – as does the Marantz PM-10, which comes with the latest version of HDAM SA3. HaF: Rainer, we thank you very much for your detailed explanations and we wish you a pleasant workshop weekend in Berlin!